In case you hadn’t noticed, I took a little break from blogging these last few weeks. It was a bit unintentional at first, spurred by the early arrival of my nephew and an unexpected trip north to meet him. I left on the morning of the eclipse, driving in complete solitude as the rest of the world headed southbound for the solar event of the century. And it was during this drive that I realized how good it felt to leave the noise behind, to detach and head towards something that felt real and honest and true. It's easy to get lost in your work - your art - especially if it's one of passion. And I'm just now getting the hang of my own creative cycle with its high highs and low lows. But I’ve learned that creativity ebbs and flows for a reason and should be nurtured with equal parts grace and gratitude. Instead of entering a period of self-loathing when the well runs dry, I’m learning to embrace the silence, to be comfortable with the space and to use this time to reset and refuel. These last few weeks have been dedicated to lingering in that silence and remembering what it feels like to prepare food and nourishment for reasons deeper than a beautiful photograph or an Instagram post. And it's been everything I needed to remind myself of the real, raw reason I love writing the recipes and stories behind Feast & Fable. When I came back to Nashville, I was greeted by the early arrival of fall. 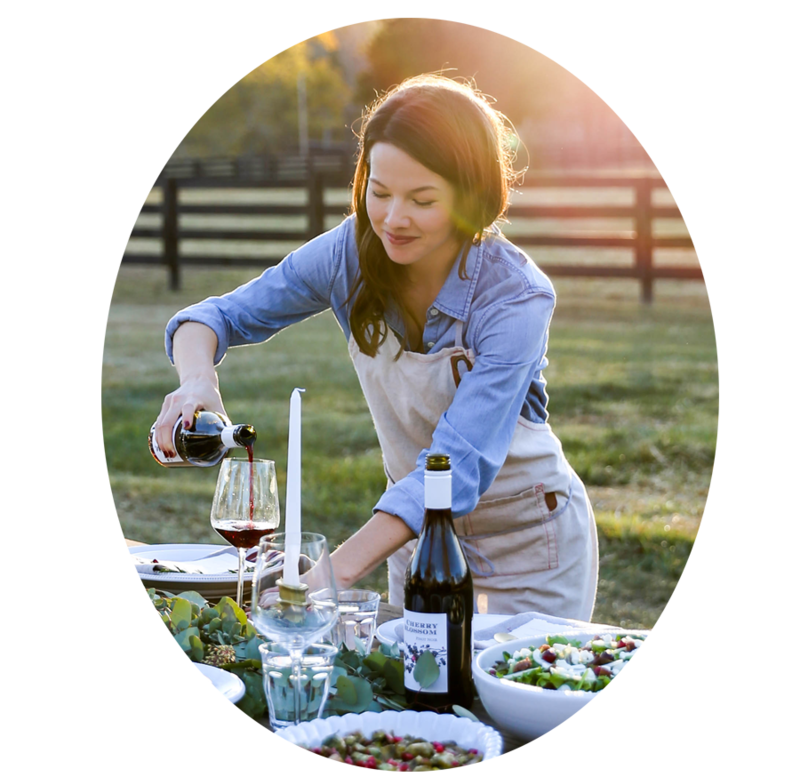 And while I’m typically one to cling to summer, I couldn’t help but be inspired by the possibility of a new season and the very foods that would bring it to life. It was nature’s timing at its best. 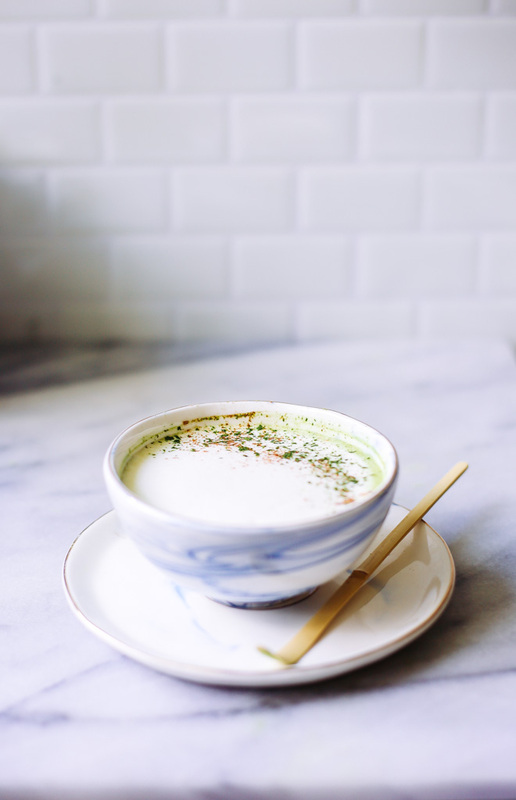 And what better way to welcome the season of slowing down and curling up than with a Pumpkin Spice Matcha Latte? I love a good homemade latte for those afternoon slumps or mornings when you feel all coffee-shop smart and a tad fancy from reading the Sunday Times. And since I’m without an espresso machine, matcha is the perfect at-home treat. 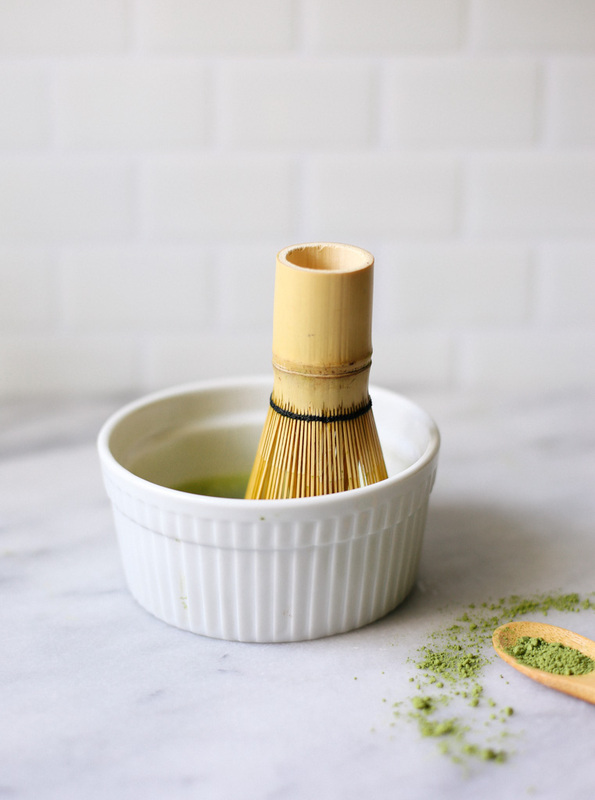 If you’re new to matcha, it’s the green tea powder that’s taking over the world. It can be used to make everything from donuts and icing to pancakes and popsicles and people are crazy about it for its health benefits. I recently read that one cup of matcha has the antioxidant equivalent to 10 cups of regular green tea! Also, if you’re someone who feels jittery from coffee or other teas, matcha is a great alternative thanks to the presence of L-Theanine, an amino acid that helps to balance the caffeine and provide a more calming energy. Matcha also helps to detoxify the body, reduce inflammation and lower cholesterol among other benefits. All good things! If you're worried that matcha's grassy, earthy taste just isn't for you, then I urge you to give this recipe a try. 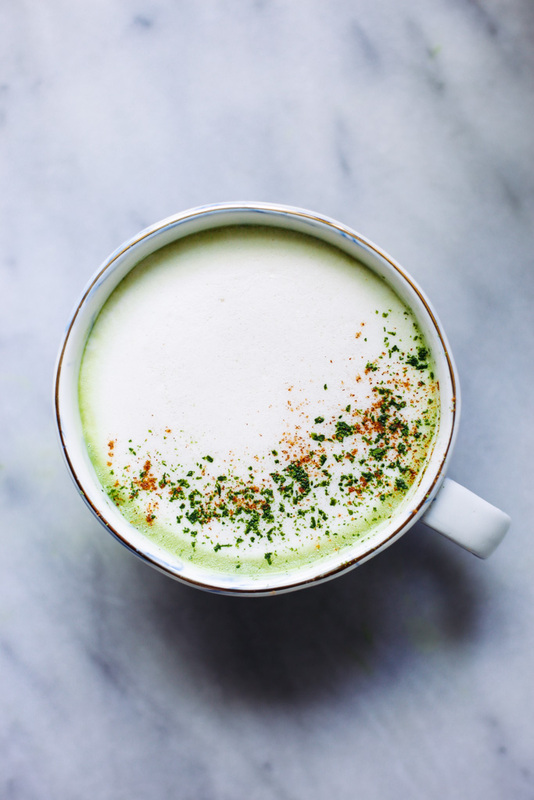 Made with homemade cashew milk and spices, it tastes like a creamy, pumpkin spice latte with the added benefit of matcha and no grassy bite. It's delicious! Place 1/2 tsp. matcha powder in a bowl. Bring 1/4 cup of water to boil on the stove. Once boiling, let sit for 30 seconds and then pour over the matcha powder. Whisk vigorously in a zig zag motion until the tea begins to foam and turn a deep shade of green. Pour into your mug and set aside. Next, place the milk, vanilla extract and spices in a small pot and bring to a slow simmer on the stove, stirring occasionally. Be mindful of the temperature so as to not scorch the milk. Once it comes to a simmer, remove from the heat. Next, you’ll want to create a bit of froth or foam and there are a few ways you can achieve this. You can use a milk frother, a blender, a french press or you can shake the milk in a sealed mason jar. Check out this post by The Pioneer Woman for eight ways to make foam at home. 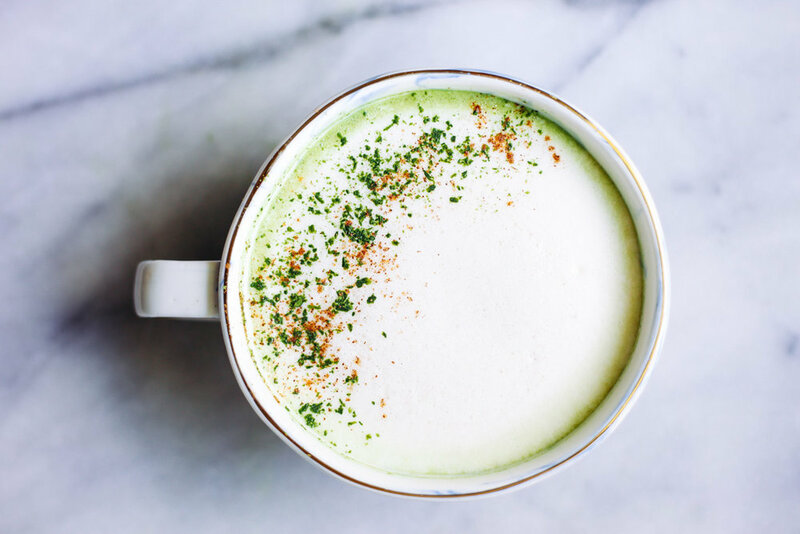 Once you’ve frothed the milk, pour over the matcha and sprinkle with a pinch of pumpkin spice and/or matcha powder. Enjoy! Place the cashews in a bowl and cover with water. Let soak for at least 4 hours or overnight in the refrigerator. Once soaked, drain the cashews and rinse throughly. Place in a blender with 2 cups of water and blend until pulverized. Next, add in your honey or sweetener, vanilla extract, cinnamon, salt. Then, pour in up to 2 more cups of water depending on your preferred consistency and blend. Note: I like my cashew milk to be a bit thicker for the latte so I only add in one more cup of water. Adding in 2 more cups of water will create a consistency similar to 2% milk. If your blender can't completely break down the cashews, then strain the milk using a cheese cloth or fine mesh strainer. Refrigerate in a covered container for up to 4 days.